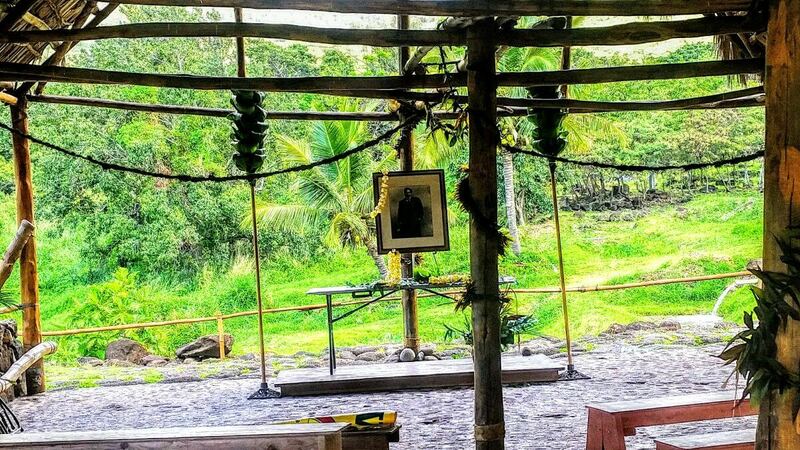 Ka’ala Farm Blog March started and finished with community gatherings! On March 10th, Ka‘ala Farm was honored to be a part of Malama Learning Center’s fundraiser Calabash and Cooks! The Ka‘ala crew provided kalo burgers, kalo flatbread, and vegan kalo burgers. Demonstrations of kapa (bark cloth) making was provided by kapa workshop participants. It was a great evening with ono food created by chefs and culinary students from the Leeward Coast. See the video of the event created by Malama Learning Center below! Malama Learning Center (MLC) is non-profit organization that brings art, science, conservation, and culture together to promote sustainable living throughout Hawai‘i. MLC has been a partner with Ka‘ala Farm since it began. MLC has brought students up to Ka‘ala to help with conservation efforts and learn about the environment. It is a privilege to partner with such a great organization! nds through the Peer-to-Peer Farm grant. The theme of the event was “Growing Native Hawaiian Farmers”. 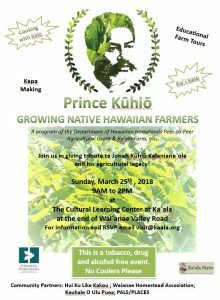 Over 100 community members attended the event which included: working in the loi and mala; lei making; kapa making; farm tours; and making kalo flatbread. 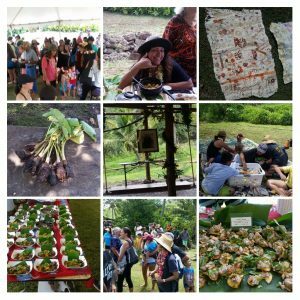 The highlight of the event was the sampling of a variety of kalo-inspired dishes made by community members. The dishes were ono! It was a great to see Prince Kuhio’s vision come to life! Mahalo nui loa to all who worked hard to make the event a success!